This is a sad tale of water voles who got in the way of the planning process. This is a water vole (taken near Sheffield). They are shy and, because they are supposed to enjoy protection, we did not try to photograph or interfere with the voles that thrive along Germany Beck during the project. As we worked along the Beck we often heard voles 'plop' into the water but you don't often see these shy mammals. There was lots of evidence of tracks and holes and this was presented at the public Inquiry. 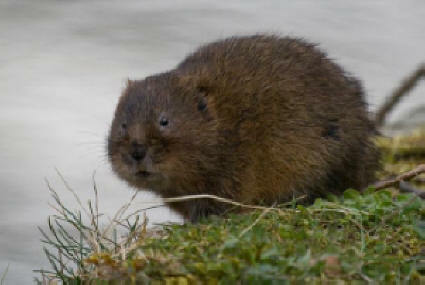 But the water voles do not officially exist - They don't exist because the powers that be decided not to look for them. There are two thriving colonies - with a blank space between them. In February I spotted that the voles were re-colonising the area so I wrote to officialdom. In spite of my efforts, the habitat was destroyed, so I told the police. They know who did it but prosecution was not considered possible. IN February 2009, when the vegetation had died back, these holes were visible. It is very hard to reach the bank from which these pictures were taken, and special permission and safety equipment was required to reach this place. We were looking for a battlefield so we had talked with Natural England (aka English Nature) to make sure we did not disrupt or destroy wildlife during our work. What a shame that those who are supposed to be responsible did not do their job. This habitat was raised during the public inquiry and evidence presented. The inspector concluded that there was no evidence for water voles even though he was shown one of the tunnels during his site visit. These are some vole tracks (you have to look hard!) snapped during one walk along the beck. We observed that the tracks seem to 'migrate' away from the river - perhaps that explains their direction of colonisation. right - the habitat scraped clean. This image was taken from almost exactly the same location as the images above - The position has marked with an industrial GPS when some soil cores were being taken. Below - The marks left by the digger. 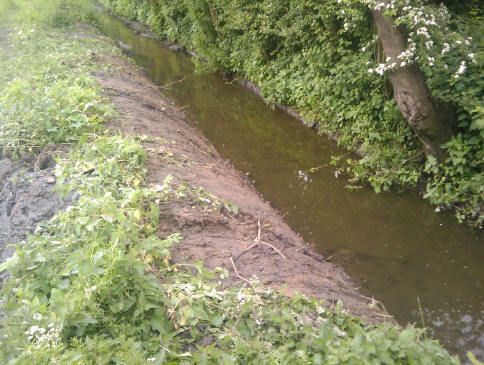 It is a criminal offence to damage water vole habitats. 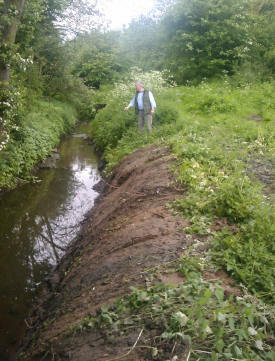 It is not clear from the image of this stretch of the beck at the destruction has significantly widened the flow. And this widening was not continued further back. 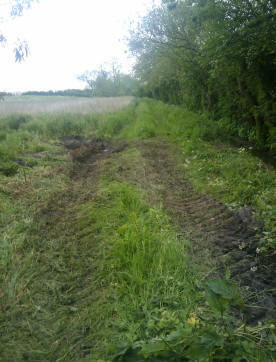 It was only the portion where there was evidence of water vole holes that was scraped. Below, right - The whole of the area covered by the images where vole-holes were seen. Now that the habitat has been destroyed - does it remove it as a consideration for the planners? It cannot be right that those with a financial interest in this land can start by denying the existence of water voles and then benefit by the destruction of the voles habitat. Jan 2010 - While they have destroyed the habitat to on the north bank, it looks as if there is a colony already established immediately opposite, on the south bank. Did the colony move or did I miss the evidence when I last checked?